My first day at the OHP shore-side office at the end of February was the same day Oliver Hazard Perry departed Newport, RI. Since then, every program and port of call has felt like a milestone for myself and for the vessel! The spring and summer is filled with fantastic programs for teens from New England and beyond. 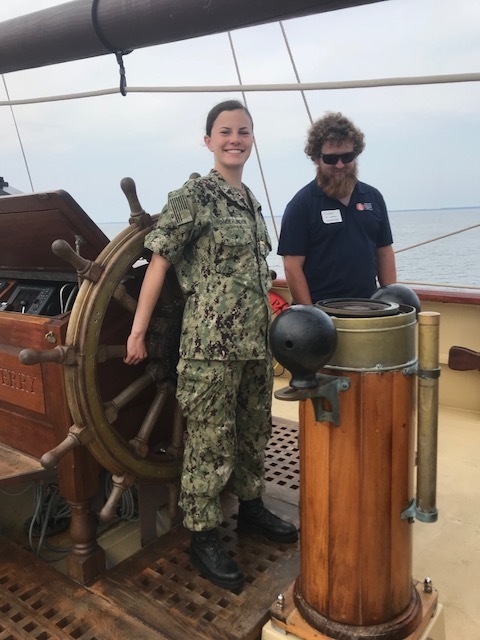 By the time this blog is published, Naval Academy Preparatory School (NAPS) Midshipmen will be wrapping up a 12-day voyage from Annapolis, Maryland to Philadelphia, Pennsylvania. These trainees will have learned about shipboard life, the mechanics of sailing, and teamwork. In addition to the duties of watch schedule, trainees had taken over the role of managing their own watch rotations by having a "watch leader" for each watch. A "navigator" was also incorporated into the watch rotation, so something to do for all hands. Trainees took hitches in the galley and engine-room as well. There was plenty of line and sail handling for all as the ship weared (jibed) every one or two watch changes. Following the NAPS voyage, trainees from across Aquidneck Island will sail from June 2nd to June 11th from Philadelphia, Pennsylvania, to Newport, Rhode Island. 22 students from Rogers High School, The East Bay Met School, and Portsmouth High School will be accompanied by a chaperone from PHS and Rogers each. Day-to-day will see the trainees standing through watch schedule as well as classroom time. Onboard Educator Vincent Tavani will be immersing trainees in maritime literature and culture. Think- singing sea shanties, reading excerpts from Richard Henry Dana’s Two Years Before the Mast, journaling, and creating! This is the 2nd voyage of this partnership- read about the first. Following a yard period for routine maintenance, teens will board for a 13 day voyage (July 2nd – July 14th) from Newport, RI to Lunenburg, Nova Scotia, to Boston, Massachusetts. The first leg of our Teen Summer Program is intended to sail through the Cape Cod Canal, Stellwagen Bank, sail up coastal Maine to Nova Scotia, and return sail to Boston. 14-18 year olds: if this sounds like as much fun to you as it does to us, there is still time to register! Trainees from the Piscataqua Maritime Commission and Brooklyn Boatworks will sail from Boston, Massachusetts to Portsmouth, Hew Hampshire July 18th to July 25th. The Piscataqua Maritime Commission sends local teens deemed at-risk to sea to develop self-confidence, leadership skills, and teamwork. At their spring fundraiser in April, Brooklyn Boatworks raised funds to send 10 trainees to sail on OHP. OHP is so proud to partner with this program and their mission- Encouraging, Inspiring, and Empowering young people through boat building & sailing. Each class of 12 middle school students must work together throughout the school-year to build one Optimist pram. From August 2nd to August 9th, trainees from the Eerie, Pennsylvania Cathedral Preparatory School and Villa Maria Academy will sail from Portsmouth, New Hampshire to Boston, Massachusetts. One of Oliver Hazard Perry’s founders, Vice Admiral Thomas Weschler, was an alumnus of Cathedral Prep. This will be the 3rd voyage of this valuable partnership. Last but not least- the second leg of our Teen Summer Program from August 12th to 17th will sail from Boston, Massachusetts to Newport, RI. This voyage intends to sail near and around Provincetown, Isle of Shoals, through the Cape Cod Canal, Buzzards Bay, and return sail to Newport. 14-18 year olds: if you want to sail New England and see whales, there is still time to register! There will be plenty of opportunities to visit and tour the ship throughout the summer at our many ports-of-call. Follow us on Facebook and Instagram (@ohpri), and sign up for our newsletter to learn the where’s and when’s!